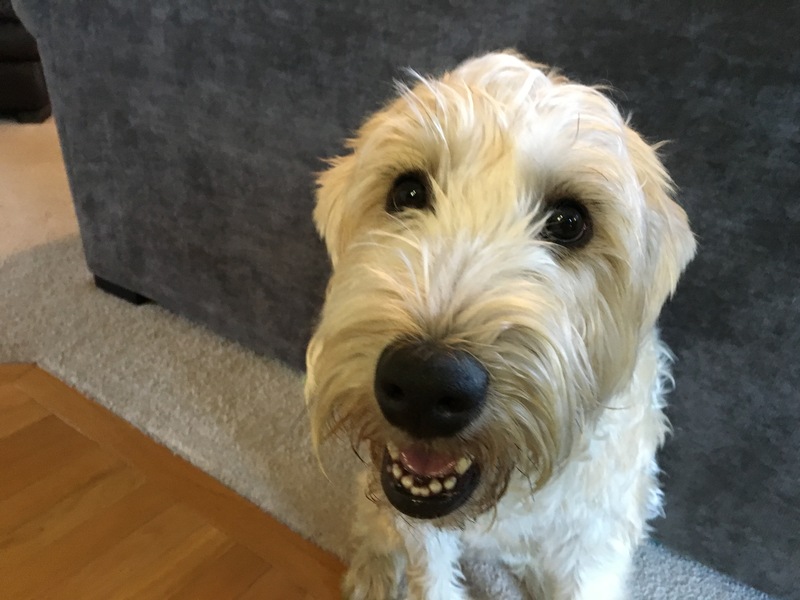 Lizzy is a two-year-old Soft Coated Wheaton Terrier who gets over excited and jumps up on people or knocks kids down, hates the vacuum cleaner and counter surfs. She also plays pretty rough with neighbor dog Riptide. I’ve seen a lot of excited dog behavior when I arrive for sessions with my clients over the years, but Lizzy certainly had a distinctive way of greeting guests. I sat down with Lizzy and her guardian to discuss her behavior and how I could best help. In the course of that discussion I found out that Lizzy didn’t really have very many rules she was expected to follow. Dogs go through life probing to determine boundaries and limits. If you only have one dog you can often get away with not having a lot of structure in its life. But for dogs that are more rambunctious or in homes with multiple dogs, rules and boundaries are crucially important. While she is not the highest energy dog I have ever worked with, adding some rules and structure can go a long ways towards helping her develop a deeper respect for the authority of her guardians. Because she comes from a line of herding dogs, consistently providing structure and discipline ill go a long ways towards heading off unwanted behaviors. After suggesting some simple rules to incorporate into her daily life, I went over a series of escalating consequences that I like to use whenever a dog is breaking the rules or engaging in unwanted behaviors. I developed these rules and consequences after observing how dogs communicate and interact with one another. Because they are extrapolated from the dog’s normal modes of communication, most dogs respond to them immediately. I walked her guardian through an exercise that will help her practice using these consequences while also helping the dog practice control and self-restraint. These are two crucial skills that Lizzy will need to develop in order to adopt better behaviors when playing with other dogs, or for facing her nemesis, the vacuum. The family’s father joined us halfway through the session and we used his arrival as an opportunity to practice applying these new consequences to the door greeting. By breaking down the greeting into individual steps and helping the dog practice each one successfully before moving onto the next, we were able to help the dog stay under control and behind the border that we communicated to her as the dad knocked on the door over and over. I suggested that the guardians call or text one another when heading home so that they can practice using this technique at the door. Another major problem that Lizzy’s guardian wanted to address was her reaction to the vacuum cleaner. Many dogs react to vacuum cleaners for multiple reasons; not only is the sound alarming to them, vacuum cleaners often kick up a lot of dust and dander into the air. This can confuse a dog as it renders them temporarily nose-blind. Because dogs sample the earth through their nose, this can lead to frustration. We applied a similar technique to the vacuum cleaner than we did to the door. We also added a positive reinforcer and a command word so that Lizzy’s guardian can verbally redirect her in the future. Lizzy responded so well that it only took a couple of minutes before we were ready to try it again. Lizzy’s guardian will need to continue practicing this technique while ratcheting up the level of intensity. At this stage, turning the vacuum cleaner on was too intense for her to deal with. I suggested that her guardian apply the same principle but have someone turning the vacuum cleaner on and off at the far end of the house so the sound is barely audible. Once Lizzy can process the sound of the vacuum cleaner without seeing it at a very minimal volume, her guardians will be able to gradually collapse the distance between the dog and vacuum cleaner until the dog is able to be in the same room with a running vacuum without reacting. By the end of the session, Lizzy was showing more respect for her guardian’s personal space and authority; responding to their commands and corrections right away. Now that we have laid a foundation of structure, Lizzy’s guardian and I headed off to their neighbor’s house so that I could show them how to bring the dogs together while maintaining control. When we got to Riptide’s lawn, Lizzy started to breathe heavily and strain against the leash. I stopped and placed her into a sitting position so that we could wait for her to calm down before proceeding. Once Lizzy had returned to a calm and balanced state, we took another couple of steps towards the fence gate. Again we stopped and put Lizzy into a sitting position when she started to get excited, waiting until she was able to relax herself before continuing. Only when the dog had returned to a completely relaxed state did we take another couple of steps to the gate. We had to stop four times over the course of about 25 feet before we reached the gate to Riptide’s yard. I spent another couple of minutes at the gate opening and closing it until Lizzy no longer tried to run through ahead of me when it swung open. By the time we entered the backyard. Lizzy was excited, but not nearly as excited as she normally was. I knew this was the case as both dogs guardians commented on their more subdued behavior when playing. While I would not call it calm, the dogs play did not escalate out-of-control because we had taken our time before getting them together. After about 10 or 15 minutes of heavy playtime the dogs decided to take a break. Because both of these dogs are younger, the few occasions where they got overexcited is likely due to this immaturity combined with inadequate structure at home and overexcitement at the prospect of getting together. By stopping anytime the dogs started to get overexcited, we were able to help them remain their composure. Combined with the work that we did with each dog individually at home, these dogs can learn that they can play together – up to a limit. The guardians will likely need to monitor and observe the dogs play over the next week or two – giving them a time-out anytime either dog starts to get overexcited. 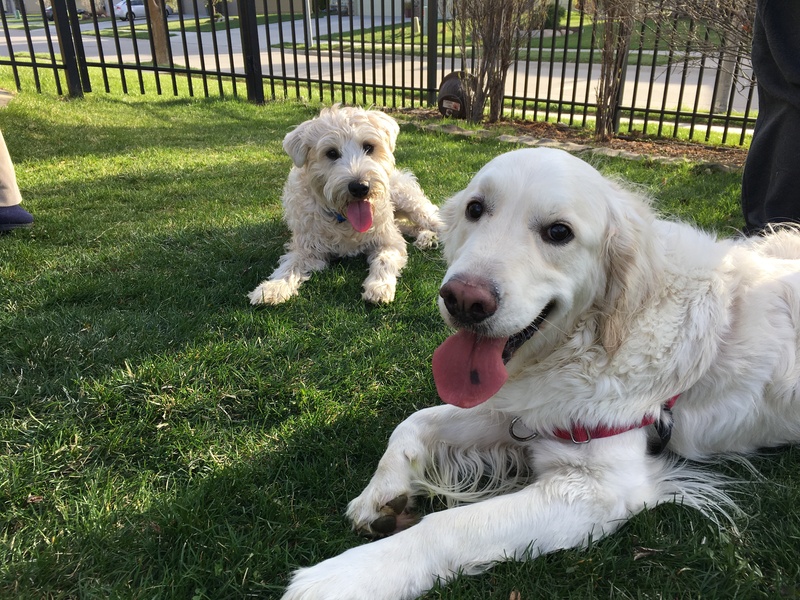 With some consistent timeouts and added structure at home, the days of the dog’s play time getting out of control should come to an end.